When it comes to popular outdoor installations on residential properties in and around a large part of Verde Valley, Flagstaff, Lake Montezuma and Munds Park, most people prefer to get patio installations. 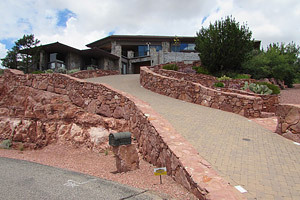 Along with decks and outdoor kitchens, this installation is preferred by many property owners across Sedona, Cottonwood, Village of Oak Creek, Cornville and Clarkdale too. When you have a patio on your property and build any structure on it, you want the space to look attractive and be functional too. It’s why many people hire the services of companies like Landscape Magic. With over a decade of experience in this field we have proved our expertise in installing alluring and long lasting landscape installations. When we handle any patio design and build projects, the focus is on using the best materials and workmanship. The stone lends a very elegant look to any outdoor space. In case your home is designed on a more contemporary/modernistic/formal style, we can use select cut stones. The alignment and pattern will be done in such a manner that it complements the look of the rest of your home. In case you have a more casual styled home, we can use irregularly shaped flagstone paving; this blends in well with the rest of the features on your property. We use the best natural stone paving and highly skilled and experienced personnel handle the work to ensure you are 100% satisfied with the job. We provide high grade end-to-end landscaping solutions. You can use this web form to send us your queries or request for a free quote. You can also speak with the Landscape Magic experts at 928-284-9314 and tell us what your flagstone patio requirements are. We handle projects including landscaping and property maintenance, construction of retaining walls and installation of pavers and water features too.